The forest alongside the road to Rock Lake in Algonquin Provincial Park in Ontario, Canada comes to life in an array of colors during the Fall. 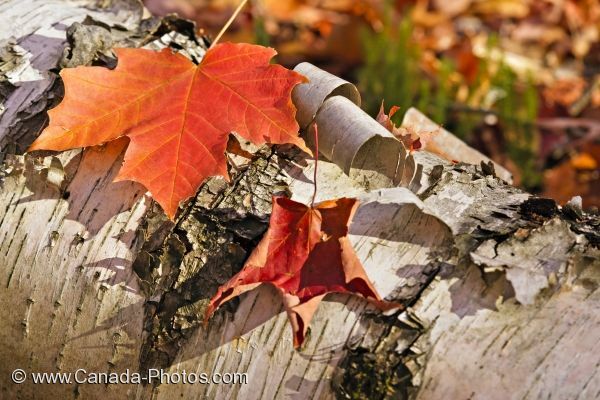 Two colored Maple Leaves have fallen off a tree and laid themselves to rest upon an old tree where the bark has curled and started to peel away. One of the Maple Leaves has curled over at the pointed tips, while the other one still shows off its distinctive shape with the veins running through the yellow, orange and red hues. The forest floor around the tree is blanketed with Fall colors as a majority of the leaves have dropped from the trees which are preparing themselves for the cold winter months. Thousands of visitors come to Algonquin Provincial Park in Ontario, Canada during the Fall to witness the colored forests. Picture of Maple Leaves in their Autumn hues on a tree along the road to Rock Lake in Algonquin Provincial Park, Ontario.